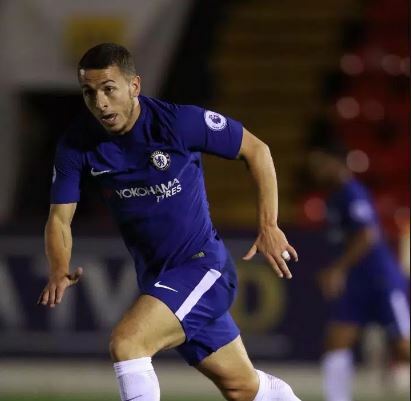 Chelsea player, Kylian Hazard is being linked with a departure from Chelsea before the close of the winter transfer market. Goal reports that Chelsea are prepared to let Kylian, younger brother to Eden Hazard, leave the club either on loan or in a permanent deal during the current transfer window after handing him just a one-year deal in the summer of 2017. Kylian joined Chelsea from Hungarian club újpest in August 2017 and has yet to feature for the first team to date. He played nine matches for the reserve team in the EFL Trophy and Premier League 2, scoring one goal. A product of Tubize, Kylian Hazard, has worn the jerseys of Lille, White Star Bruxelles and Zulte Waregem in the past. Another of his brothers, Thorgan played for Chelsea before moving to Borussia Mönchengladbach in January, 2015.